Parks and Recreation Youth Says "ICE Holds Are Wrong!" Last Wednesday, RAWK partnered with Kalamazoo’s very own City of Kalamazoo Parks and Recreation (Parks and Rec) program. We worked with the 8 to 10-year-olds, with hopes of carrying out RAWK’s mission, to celebrate and amplify youth voices through the cultivation of reading and writing skills via joy, creativity, equity, and access. This mission was upheld as RAWK taught youth at Parks and Rec how to create their own book with their own world, regarding something that they were passionate about. In doing so, one of the students from Parks and Rec, Susanna Day Lee, used this opportunity to write about an issue that is relevant to many individuals today: ICE Holds. ICE holds occur when an immigrant with no legal status is arrested or detained for any reason by local law enforcement authorities and Immigration and Customs Enforcement (ICE) may place a “hold” on that person. This means if a friend or relative attempts to pay a bond to have the person released from jail, local authorities will not release them but rather hold them to allow ICE to transport them to an ICE Detention Center. When a person has been arrested, local law enforcement run their fingerprints through various federal databases. This notifies ICE if the person is in local custody and that there is no record of the person having a lawful status. ICE then places a hold on a non-citizen when it believes that the person is subject to removal by filing a detainer with the local law enforcement agency. The detainer requests the law enforcement agency to notify ICE in advance of its intention to release the person, and to hold that person for an additional 48 hours, excluding weekends and holidays, to allow ICE to take custody of the person. Susanna was inspired to write about ICE holds from her personal experience with the system. Susanna’s mother’s church have advocated against the unjustified ICE holds after encountering a woman named Saheeda who would have been deported to almost certain danger had it not been for the help of her mother and the people of the church. Susanna’s mother’s church began providing a sanctuary for the woman who was facing deportation about a year ago. This sanctuary is only possible because police are not legally allowed to arrest persons in a church. Susanna’s story describes the woman’s story and how she, her mother, and the congregation fight for justice for this woman and protect her and anyone to come after her. RAWK couldn't have been more impressed by the way the student used her book to advocate for what she believes is right, and stand up against what she believes is wrong. Way to use your words to fight for equity, Parks and Rec youth! What an honor for RAWK to have been a source for your outlet. Peace House is a community non-profit organization made up of two families, the DeWaeles (Jen and Mike), the Mechtenberg-Berrigans (Molly and Jerry) and their kids. These two families have been close friends since they graduated from Kalamazoo College in the mid-1990s. The two love duos went separate ways after college to explore the world at their own pace. They came back together. In 2005 with hopes to go back to Kalamazoo Michigan and find work they would all enjoy and would also give back to their community. In 2006, the pairs came back to the Eastside of Kalamazoo where they rented a home that would soon be one the homes that we know as Peace House. The founders sought out the Eastside of Kalamazoo after discussion with city council member Don Cooney, where they discovered that the Eastside had the best population for their plan and was an area with lower income families which who could benefit from the work Peace House would do. By 2009, Peace House doors were open to the community. Peace House physically described, is two homes that come together through their joint backyards. The backyard of these two homes is where all the magic takes place. In this very grand backyard, there is a huge playground and deck which the founder built themselves thanks to a grant they received. In the fall Peace House serves as an after-school program where they help students with homework. In the summer it’s a different game plan, Peace House becomes the communities’ day camp. This year Peace House launched their very first Youth Advisory Council for teens. In this council, the teens discuss positive decision-making skills while also building lifelong relationships with the others within the council. The council members are hired for the summer to assist with Peace House summer adventures. The RAWK team are so grateful to have partnered with such a great organization who are giving so much to this community. Both the Peace House and the RAWK team encourage you, our readers to do the same. Think about it, you have the power to bring about change in your community, will you? Community Partnership Spotlight: Young Kings & Queens Inc.
Our organization wouldn’t be what it is without the help of volunteers and the collaboration with differing organizations within Kalamazoo County. Young Kings and Queens Inc. (YKQ Inc.) is a non-profit organization that is collaborating with us this summer through a book club. YKQ Inc.’s mission is to empower and inspire minority youth to live beyond the scopes of societal norms through exposure to broader experiences and information. Using the tenets of culture, community and identity, YKQ, Inc. raises overall awareness of its youth through education and experiences. They specifically work with youth between the ages of nine and thirteen and have decided to team up with RAWK this summer. Jason Conde, our Director of Education, is leading youth from YKQ Inc. in a summer book club as they read the award-winning young adult novel by Angie Thomas, The Hate U Give. Thomas’ novel is centered around Starr, a young African American girl who witnesses the death of her childhood best friend by the hands of a police officer. The Hate U Give opens the narrative for activism and the strength of youth voices in times of trauma and hardship with a focus on one’s identity. Youth from YKQ Inc. came to the RAWK center at the end of June and received free copies of the novel. We discussed what we thought the book would be about and set our own daily reading and writing goals. The overall goal is to get them writing in their notebooks every day that we have provided for them and to have them finish the novel before our second meeting. The book club members will return again on August 2nd to discuss their reactions to the book and how they see their stories represented within the novel and how the novel may impact their own stories. Then the youth will come back for a third and final visit the following week to share their creative written responses about the book and other pieces of writing to create an anthology they will be able to keep. Overall we have been excited to work with YKQ Inc. because their mission aligns strongly with RAWK’s and it opens doors for both organizations, allowing voices and stories to come together that might not have interacted if this collaboration did not exist. We have also been excited to spread the influential and valuable work of Angie Thomas by assigning The Hate U Give as it encourages youth to stand up and use their words even when it's tough, even if their voice might shake. John Ephland, one of RAWK’S fabulous volunteers, has lived in Kalamazoo, MI for about 21 years but is originally from Chicago, IL. Ephland has been with RAWK since March 2018 and has shown nothing but excitement to be a part of RAWK’s programming. Ephland says, “The more I volunteer, the more I learn why I started volunteering in the first place.” Ephland says the reason he volunteers has to do with one question: what would you do if you didn't have to do anything? There is no necessity to do anything but live. His answer, of course, is exactly what he does here at RAWK, volunteer. RAWK isn't the only volunteer work Ephland does as he is also a part of KNOW (Kalamazoo Nonviolent Opponents of War) and Voters Not Politicians. Ephland thinks these organizations creates a positive buzz amongst the community and is important work. Ephland’s duty as a volunteer has been to educate and stay in touch with the community. This is why Ephland enjoys the RAWK community so much, because he is able to be involved in students’ lives for two to three hours a day, and because it keeps him connected with the younger generations. Ephland says the RAWK volunteers and workers are key to his experience at RAWK. He loves the post-workshop discussions they have, the flexibility to adjust programming in order to achieve better results, and giving one another constructive feedback. Which also is a key component in RAWK’s students workshops. Ephland expresses how “the program doesn't grade the students on their work. This is teaching RAWK students to give one another constructive feedback rather than the concept of what is right or wrong within their writing.” Ephland says this attitude pays off and contributes to why the students want to be here and don’t take much convincing to participate in the programs. Besides his volunteer work Ephland also writes, his expertise is music. His latest works involve writing interviews and reviews on Jazz. If you’d like to support Ephland as much as he supports us, go and visit his works at allaboutboutjazz.com and search his name “John Ephland” in the websites search engine. We’d like to thank you, John Ephland, for always RAWK’n; we couldn’t do it without you! The Youth Advisory Council at RAWK has been on a bit of a break since the end of the spring/school year but is now back in action! Where's Waldo in Kalamazoo? Waldo is at RAWK! Starting July 1st, RAWK is participating in Bookbug’s month-long scavenger hunt, Where’s Waldo in Kalamazoo? Bookbug gives each of the 29 participating local businesses a six-inch Waldo standee to secretly display somewhere in their business. Bookbug then gives you, the participants, a “Find Waldo Local” passport with the names of the participating merchants. When you visit our store or another participant and spot Waldo, we’ll stamp your passport. Throughout the month there will be incentives awarded to you for each milestone that you reach. Collect at least 10 stamps and bring them to Bookbug, your find Waldo Headquarters, to claim an “I found Waldo” button and “$1 Off” coupon. Collect at least 22 of the 29 possible store stamps and receive a button and a coupon, and you’ll be entered in a drawing for a 6-volume deluxe set of Waldo books and other fantastic prizes during the Waldo celebration at Bookbug on Friday, July 27th at 4pm. The goal of the event is to give participants the opportunity to visit the broad range of local businesses around the Kalamazoo community and build lifelong relationships with the businesses. It is an honor for RAWK to join Find Waldo this year because the event gives the community a reason to explore all the great things our local businesses have to offer. We can’t wait for you all to hit the streets to see what Waldo has in store for you all over town, and especially at RAWK’s very own storefront! RAWK’s storefront, The Geological & Musicological Survey Co. is relatively new. All sales in our store go directly toward supporting free programs for Kalamazoo youth, so be sure to come ready to shop during your Waldo’s scavenger hunt journey. This past Monday, June 18, was the first day of our Youth Leadership Camp. The Youth Leadership Camp is a week-long training for high school students who will be helping RAWK out with our 4th and 5th, and middle school summer camps. The leaders mentor the kids during their camps and also receive a stipend for their work after completing training and assisting with one camp. Karina Pantoja is from the small town of Paw Paw, MI and has just finished her second year of school at Kalamazoo College. She is pursuing an English major with an emphasis in Creative Writing as well as a concentration in Women, Gender, and Sexuality Studies. At K College she has served as the Assistant Editor of the school’s literary magazine The Cauldron along with being one of the Co-Directors of the Kalamazoo Poetry Collective and a Co-Leader of the mind-body-wellness group called K Team. 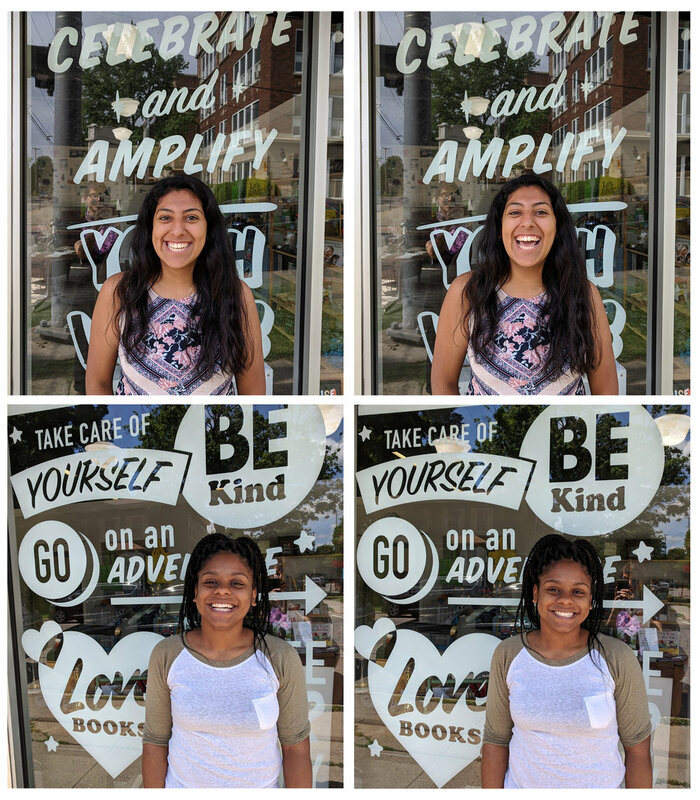 Karina is thrilled to be a part of RAWK and to make connections with the youth in Kalamazoo county as they discover and enhance their skills in reading and writing. She believes that both reading and writing can serve as avenues for social change and relationship building with others and the self. Karina is looking forward to spending her summer at RAWK and exchanging music suggestions and puns with anyone willing. Next up is Carolyn C Coulter, who can’t wait to get started at RAWK! She is from the Westside of Chicago, IL and came to Kalamazoo to study at Kalamazoo College in 2016. At Kalamazoo College she is Majoring in English with a concentration in Journalism. She also plans to minor in Theatre Arts because she loves the behind scenes of producing a play. In her free time she loves to watch Netflix and listen to R&B music. When reading, she tends to read anything that informs her about a topic in history in a engaging way because she soooo, doesn’t like history books. She can’t wait to learn more about the Kalamazoo community and grow with you guys! We're in for a wild summer so it's the perfect timing for their arrival. Stop in and say hi! RAWK is honored to have been asked by The International Congress of Youth Voices to send two delegates to this year's inaugural event in August. Co-founded by Dave Eggers and Amanda Uhle, The International Congress of Youth Voices will bring together 100 students from around the world — United States, Iraq, Sweden, the United Kingdom, Syria, Ireland, Australia, Iceland, Burundi, Honduras, Cuba, Denmark, Venezuela, Zambia, and Nepal so far! As their website states, "The Congress was founded as a means to amplify their ideas and energy and to unite young people for a weekend of collaboration ... The event is designed to provide a path to leadership for all delegates and represents a continuum from students who have exhibited potential in local writing and tutoring programs to writers and activists who have already made notable achievements at a very young age." Familiar with the work we do here in Kalamazoo with youth writing, we were asked to choose two delegates based on their commitment to leadership and social justice, as well as their passion and eloquence as writers. Both Destiné and Sydney have done just that over the years. As a leader within RAWK, Destiné brings her heart to the table to help make real change in our community. She uses her words to connect with youth in beautiful ways, and to help grow our organization's commitment to equity and access by building a strong volunteer corps and influencing program and organizational development. She is driven, filled with empathy and compassion, ready to ask questions and find answers. A poignant writer with a keen eye, Sydney has grown into a leader at RAWK, now serving on our Youth Advisory Council and is a Youth Mentor. Her charge for a more equitable world is clear both through her writing and in conversation. She is a dreamer and a doer, someone who is ready to roll up her sleeves and make change a reality. We will be sure to keep you posted on this remarkable event as it unfolds. Until then, please join us in congratulating these two fantastic young women. This is huge, and we are thrilled to celebrate their contributions to our community and the adventure that lies ahead. Oh! And be sure to read more about The International Congress of Youth Voices on their website and in The Guardian. Welcome RAWK's New Executive Director! Join us in welcoming Nicki Poer as our new Executive Director! After a months-long search with an impressive pool of applicants with widely varied experience, we are thrilled to celebrate the dynamic addition of Poer to our organization. We are grateful for her energy and enthusiasm, confident that she is the leader RAWK needs in this new phase of our organization. For the past nine years Nicki has served as the Director of Education & Outreach at the Kalamazoo Civic Theatre where she created and runs the Academy of Theatre Arts which runs theatre education programs year-round for youth and adults. Her work at The Civic also includes partnerships with Kzoo Parks and Rec, Communities in Schools, and Kalamazoo Public Library. Originally from Illinois, she came to Kalamazoo from Connecticut where she was the Education Associate for Community-Based Programs at the Tony Award-Winning Hartford Stage. Nicki holds an MFA in Acting from the University of Montana and a BA from Millikin University. She found her passion for working with youth while touring through the US, Canada, and Guantanamo Bay, Cuba with the Missoula Children's Theatre. Karen Trout, RAWK board president: "On behalf of the entire board of directors, I have full confidence that RAWK will be in excellent hands under Nicki's leadership. She brings enthusiasm, strong community connections, and proven administrative skills, all of which will ensure RAWK's unique ability to celebrate and amplify youth voices, and thereby contribute to youth success." The work Poer has done in our community to provide platforms for youth to flourish creatively is a fitting compliment to the work we do at RAWK. The curriculum at the Academy of Theatre Arts has focused on emotional intelligence, empathy, and building self-confidence through performance and technical theatre skills. "My passion for the community of Kalamazoo runs deep and I am honored to join RAWK to help the youth of Kalamazoo to continue to have safe spaces to find their voices, share their ideas, and express themselves," Poer shares. "RAWK has experienced immense growth over the past six years due to the dedication of an extremely skilled staff, supportive board of directors, loyal volunteers, and the community of Kalamazoo itself. As we look to the future, RAWK will continue to expand programming to adjust to the changing needs of Kalamazoo youth to help them succeed in an ever-changing world." Nicki lives in Kalamazoo with her husband, Brad who is the theatre professor at Kellogg Community College and her children, a 7 year old daughter and 3 year old son. The family is completed by their 12 year old Australian Shepherd, Elwood who is named after the Blues Brother. She will be joining the RAWK team in her official capacity at the beginning of July 2018. Yet another reason why this summer is going to RAWK! The first big project for RAWK’s Youth Advisory Council was a window display for the three empty panes in the front of the store. We wanted something that would draw attention to the store to give it a fun, welcoming look. So, we got an artist to help us develop a plan. Beverly Fitzpatrick, a self-taught Kalamazoo artist, graciously agreed to work with us. When the RAWK YAC members sat down with Beverly for a brainstorm session, it was clear that we had big ideas. But with limited time, and frankly patience, we had to trim our ambitions down to something more reasonable. “There were a lot of voices and thoughts to consider, and I just tried to distill them into something that caught the spirit of what I was hearing and could be executed under the time constraints,” Beverly said. Beverly explained to us that she usually works with collages and sculpture. “I like building things. Making collages is like building in two dimensions and I spend more time recently thinking about 3D possibilities,” Beverly said. Because of Beverly’s experience with collages, we decided to make a collage of sorts out of thin paper rectangles glued to the glass with cornstarch and water, and then Beverly would create silhouettes of faces to be cut out of the paper. Beverly took that idea home and left the RAWK YAC to work. Through painstaking hours of cutting, mixing, and gluing, the process of making the collage was complete. 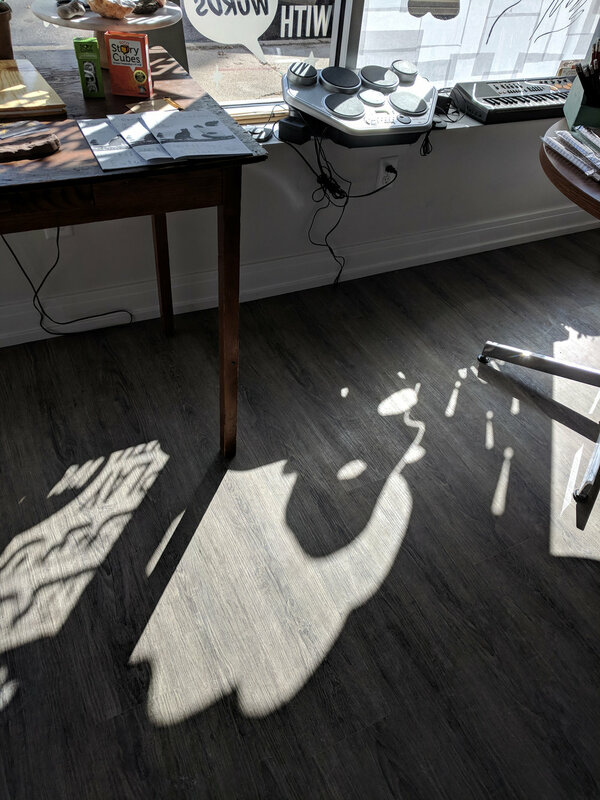 With an old school projector, Beverly projected her stencils onto our paper. Through two backbreaking sessions of outlining and scraping, our work was complete. The result is two faces facing towards each other, exclaiming silently with an empty pane in between. This empty slot is there for you to interact with and complete the picture. “Now, the question of what something ‘means’ is seldom a concrete one in art. But to me, the piece is about trying to zero in on one's own original thoughts while being constantly influenced by other voices. It can be difficult to know where your own ideas begin while you take in so much information all the time, much of it designed to persuade,” said Beverly. The window display is slated to change every few months as we partner with different local artists, as well as other RAWK programs and community non-profits, to keep the storefront fresh and entertaining. 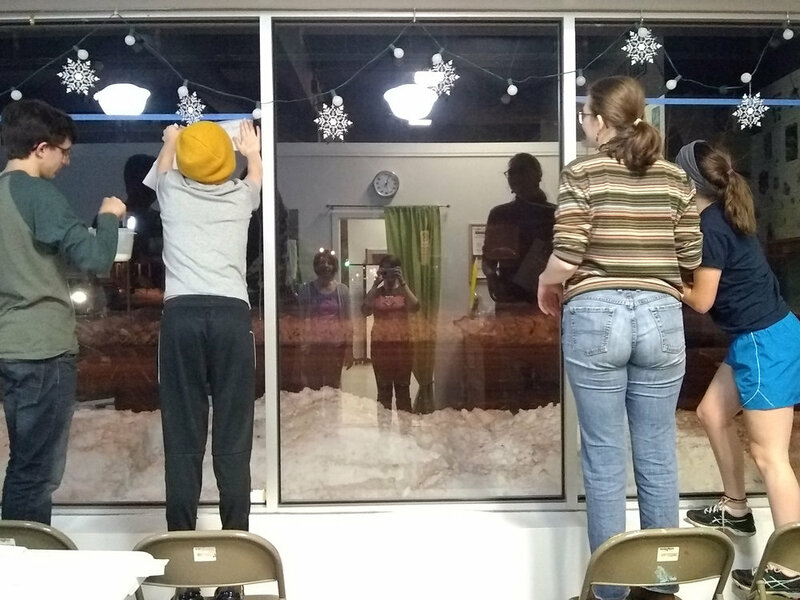 Our next window display will be a collaboration with local painter Malavika Rao and the Kalamazoo County Youth Cabinet. Thank you, Beverly, for creating an awesome design and helping the RAWK YAC achieve its first goal of completing a community art-focused and collaboratory window display. Way back in 2011, Anne and I began dreaming of RAWK. We had high hopes for what could be, and now (with hard work and unequivocal support from our community over the past 6 years) we’re living in what is as we celebrate milestones: a writing center, a storefront, a publishing center, expanding staff, growing programs and partnerships. 2018 marks the beginning of RAWK’s 7th year as an organization. We continue to dream big, to set high goals to better serve youth in our community. It is with a grateful heart, swelling with pride and hope, that I share this news. I will be stepping away from RAWK in my role as executive director. It’s an exciting time for both me and for RAWK, as I leave to pursue opportunities as an author/illustrator, and RAWK begins a new chapter here at 802 S. Westnedge. RAWK’s transition moving beyond our co-founders began last year when Anne stepped away from RAWK. Let me assure you it is a sign of a healthy, sustainable organization, that this is happening. I keep saying we’re stepping away, and that feels misleading. Really, we’ll never step away, as Anne and I will always have the honor of being RAWK’s co-founders. Our board of directors has assembled a transition committee to ensure a seamless process as we look for someone to take over the reigns who is devoted to RAWK’s mission, vision, and place in our community. It has been a privilege to lead such a remarkable group of people who enthusiastically show up to do the work—our board, staff and volunteers know the power and importance in valuing youth voice. Through RAWK, I have met so many inspiring people in our community, committed to literacy, youth, and equity. Anne and I often gush about how we are forever changed by this work—by knowing all of you and seeing youth voices celebrated and amplified in our community. I am confident that equity, access, joy, and creativity will continue to be the guiding constellation for our organization. I will forever be involved with RAWK as a cheerleader, a patron, and an ambassador, not only for RAWK but for the youth we serve. Thank you for the love and support over the years. I’m looking forward to seeing what fantastic things RAWK continues to accomplish in our community. RAWK is excited to announce that we are offering all of our programs at no cost to students! Up until this point we have offered all of our programs on a pay-what-you-can basis. As we continue looking for ways to grow and build access and equity within our community, making this step makes a lot of sense for us as an organization. We celebrate diverse voices of the youth in our community, and are honored to provide spaces to cultivate growth for the youth we serve within our programming. As an organization that strives to provide opportunities for youth to read and write in fun and innovative ways, we want to be able to give all of our youth the opportunity to learn and grow with us. We are grateful to PFC's Change for Change Program for kicking off this initiative with us this summer. The People's Food Co-op of Kalamazoo Change for Change Program gives all customers the option to round your bill to the nearest dollar every time you shop. You can even tell the cashier the amount you'd like to donate when you check out. All of the money raised goes towards one outstanding organization at a time. Recipients in the past have been Loaves & Fishes, YWCA, Freedom Schools, Project X, and Fire. The PFC's Change for Change Program has raised up to almost $12,000 total so far this year! For the month of August, RAWK has graciously been selected to be PFC's Change for Change recipient. You can support RAWK this month by shopping at PFC Grocery & Deli. Turn your change into free literacy programming by rounding up your bill to the nearest dollar with every visit to our local Co-op — let's work together to help our youth RAWK for free! We are grateful for a supportive, generous community. Please consider investing in RAWK On! youth RAWK free, ensuring all young voices are celebrated and amplified in our community. ALSO, BE SURE TO RAWK THE VOTE THROUGH AUG 25! In the next 9 days, beginning Wednesday August 16, you can do good in a big way that takes a small amount of effort. RAWK the Vote for us, put us in the top 40 so we can win $25,000 from State Farm’s Neighborhood Assist program. Because of the good you do, RAWK will be able to offer literacy support at no cost to students and families. That’s right! No cost. Everyone deserves support for learning, regardless of their ability to pay. Because of the good you do, more and more young people will advocate for themselves and hear their voices amplified out amongst their community. 3. Share it with everyone you know and encourage them to be part of this extraordinarily good thing. 4. Feel good about winning $25,000 toward youth literacy. RAWK the Vote with us every day until August 25. Keep us in the top 40 so we can win $25,000 for youth literacy. Being a small non-profit organization, we are often in need of help to accomplish the many tasks at hand. We are grateful to the Community Building Internship program through the Center for Civic Engagement at Kalamazoo College. This is our second year working with their program, and benefitting from the help of a summer intern. We're thrilled to introduce you to Destine Price, our 2017 summer intern. Working with someone who grew up in Kalamazoo and whose heart is devoted to community and voice has been fun, to say the least. To say even more, Destine is inspiring. She comes to work eager to dig in, happy to take on any and all tasks asked of her, and with an honest desire to learn. She is all about collaboration and open communication. We laugh a lot, too. This summer has been HUGE for us in many ways, and her hands and heart for the work we do (both behind the scenes and with the students we've served this summer) has been essential for us. If you see Destine around Kalamazoo, be sure to give her a high five. Grateful to work alongside such a creative soul. Today I am accomplished. I rose from fluffy white sheets at 5 am sharp and transported to work within warm, wet breezes of countryside dew. I glided into the calm stories of openness at the Reality Factory and was struck with purpose. Today I feel very overwhelmed having worked two jobs and having to prepare for the next. I am thankful however, after shifting and moving this body, I have a grounding space to recoup mentally. So today I am overwhelmingly thankful to being accomplished! I grew up in Kalamazoo for most of my life, and for a short period in Pontiac,Michigan. I search. I’m currently in the process of searching for myself again in everything that I do. I find happiness in words. I find joy in music. I find peace in water. I see potential in the upcoming school year at Kalamazoo College. I find stability in the work that I do to support my health and my family’s. Right now I am putting much work into myself for positive outcomes in the near future. Why not? Why not be a part of an organization whose mission compliments my desire to see a change within youth in our community? After reading RAWK’s mission statement and purpose, I knew that I wanted to be a part of this in some way. I have the capacity to take in so much knowledge and experience in this point of my life and I felt as if RAWK was the perfect place to begin. Expressing authentic voice holds a large space in my heart and working with RAWK steadily fills that space. What's your role with RAWK this summer? At RAWK I help with just about everything! I play a role in organizing, preparation, fundraising, and brainstorming. I help with coordinating workshops before they begin at times, I help to research and draft grants, and help to do needed organizing. In my eyes, I serve as a helping hand to an organization I love to be a part of everyday. I see myself doing something that I love. From going from undecided to a decided major at K, to launching projects of my own within my community. I see myself finding the passion that I have been craving and working hard to make that vision come true. We know, we know. Sometimes it's hard to give yourself an excuse to chuck it all and spend the day reading a great book. Sometimes we think to ourselves how one solid uninterrupted day of brainstorming or drafting or revising really might give us some wind in our sails, the momentum we need to bring more energy into the rest of our lives. But there are errands to be run, cleaning up around the house to be done, preparing for that birthday party or finding the screens before spring's here. And that's why we've drummed up a solution: Write On! RAWK On! 1. Commit. Decide you're going to give yourself (and the rest of us) just one day (and not even a full one! ), March 18 from 10 am — 4 pm. You can do that with us, at our rocking (and RAWKing) party at the Kalamazoo Institute of Arts, or wherever you'd find that time most valuable. Home? Coffee shop? Our reserved quiet location? At a gathering with friends? On a hillside under a tree? 2. Register. Sign up as an individual participant or as part of a team, then grab a pledge sheet and let that support roll in. Share the pledge sheet on social media or via email so that others can support you in your efforts and simultaneously support the young minds and voices of those RAWK serves. 3. Show up. Join us at the Kalamazoo Institute of Arts for creative adventure, special guests, and prizes, or stake out a post wherever you feel inspired. Wherever you wanna RAWK, block out that time to dive in: to words and ideas, to a book or a poem or any writing project that's been gnawing at you, to writing prompts we provide you for the day if you need a little nudge. Your participation in Write On! RAWK On! helps nurture a community of lifelong literacy support, by providing scholarships for writing camps, publishing student work, growing a network of engaged youth and educators and volunteers, and so much more. If spending the day writing and reading is not for you, you can still feel great about investing in young minds and voices by making a donation, volunteering, or sponsoring. Give yourself, and us, just this one day. Give your brain an adventure and your community an investment. Write On! RAWK On! As we're revving up for the second year of RAWK Writers' Room at Maple Street Middle School we want to shine a spotlight on two volunteers who really make it all happen. Thank you to these two bright and caring people for sharing your time with our students. Without further ado, here are Nicole and Doug! Happy New Year! OK, it’s still 2016, but once you’ve been a student, the beginning of the school year feels like beginning again each year. You’ll find a new slate of fall workshops on our calendar with new (and dear, returning) facilitators, and we’ll also have new opportunities to read with us as we emphasize the R in RAWK. And we have a new RAWKstar in our midst, so we’d like to introduce you to Victoria Marcetti, our new communications associate. Is it really the end of the summer? We're still basking in the glow of our RAWK READS! event last night at Bookbug—always proven to be a beautiful reflection of our summer that's filled to the brim with writing, creating, and planning. Our students sharing their work with an eager audience is integral to our core beliefs, as we're always striving to celebrate and amplify youth voices. While last night was the perfect close to our busiest summer on the books, our office is far too quiet today. We want to be congratulating each other and sharing sweet anecdotes from the night, but we're missing one person. Last night also marked the last day for Anja, our summer intern.